They said it couldn't be done. They said compiling a list of ten gorgeous Japanese cars currently for sale was a fool's errand. What they didn't know was that in Japan the cars aren't designed to be as purposeful and uncharismatic as many of their American offerings. In fact, half of the cars on the list are not sold in the United States. And while no cars from the land of the rising sun made it onto our Ten Most Beautiful Cars list, it was easier than we thought to find these ten most gorgeous Japanese cars. It's not hard to appreciate the 2009 Nissan GT-R. Unlike almost anything on the road, this latest iteration of the famous Japanese supercar not only outperforms many of its pricier competitors, it also offers a look that's both familiar and fresh. The aggressive front and strong profile makes no secret of the GT-R's ability. While the current Nissan Altima isn't unattractive, the car's Japanese cousin is downright becoming. The sedan's elongated proportions and sweeping lines are distinctly European, while the sharp headlights and large grille are particularly Nissan. Let's hope this is the direction they're going to take American Nissans sometime soon. As much as we like the base Honda S2000, the S2000 Type S takes the modest and becoming sports car and adds a dash of Super Potential to the equation. Though some may fault it for its large wing and aggressive ground effects, these bits not only add aerodynamic function to the S2000, they also add much needed teeth. If you've got a hankering for one, the Honda S2000 CR is fairly similar. A minor refresh this year hasn't changed the fact that the Mazda RX-8 design is getting a bit long in the tooth. 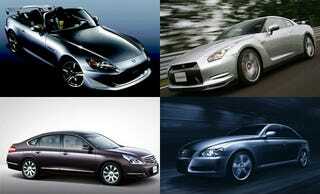 Nevertheless, the RX-8 is still a head-turner. A mixture of rotary-inspired shapes and exotic details, it's a car that only Mazda could design. One of the best-looking rear 3/4 views of any GT, we're glad those rad rotarians finally added a front to match with the 2009 RX-8. One of the favorites among Kei Car enthusiasts, the tiny Copen from Daihatsu may not be the most powerful car on the list (in fact, it's the least powerful) but it's undeniably the cutest. In the tradition of tiny roadsters, the Copen looks like something fun a British company like MG would build if British carmakers like MG weren't all owned by the Chinese and Indians. It's proof that good things do sometimes come in small packages. In addition to being a competitive LeMons racer, the MX-5 has historically been a low-key but sleek roadster, and the latest iteration is no different. The slightly flared fenders, rounded surfaces and low profile are timeless and beautiful. One of the best looking sedans that few people have ever heard of, the sleek Toyota Mark X may be related to the American Lexus GS300 but in a way that makes us think one of the two was secretly adopted. This RWD sedan has the shapely curves of an E-Class Mercedes combined with the sloping and textured nose of an Alfa (sans the crest) and that wonderful disregard for subtlety that makes us love Japanese cars. The Infiniti G37 is a coupe that just missed getting placed on our most beautiful cars list. A drastic improvement over the previous generation, the G37 practically sparkles in person. Unlike most Japanese luxury cars, the sculptors of the G37 took chances with the design. The gently raked beltline and 1980s-professional-woman wide shoulders balance the feminine and the masculine like few modern cars can. But it's the details, like the 10-spoked wheels and creased grille, that make this otherwise toned-down coupe scream.